We helped put a stop to the 6th st. road diet and pushed for safer solutions. We're happy to say that reason won out: That small group of Special Interests Activists won't be getting their “Road Diet” on 6th St. in Los Angeles after all. Following form, they made false claims about safety in their quest to force motorists off of L.A.'s streets. Kudos to Councilman Ryu for considering the facts, listening to his community, and coming up a plan that actually will make the road safer. A big thanks to everyone who rallied to support rational analysis of the data and real solutions. Special Interest Activists wanted to take away two heavily-used lanes from cars on 6th Street between Fairfax and Highland. Their plans would have created gridlock and without fixing the problems that led to past accidents. Safety along 6th Street for residents, commuters, pedestrians, cyclists and motorists alike continues to be a priority for me and my office. In early 2016, my office, along with the Los Angeles Department of Transportation and multiple community stakeholders embarked on a comprehensive review of the road’s configuration, crash data, recently completed speed surveys, and available mitigations to address the collisions we’ve been seeing. Based on that work, the City’s Department of Transportation (LADOT) developed a series of potential improvements for 6th Street between Fairfax and La Brea Avenues which were presented at a community open house on Saturday October 21st, and then in an open survey released by my office to gather input from community stakeholders. The full survey and final results can be viewed here. Of the 712 responses received, approximately 60 percent of respondents stated their support for a variety of intersection-specific road improvements, including continental crosswalks, left-hand turn pockets at 6th Street and Hauser Avenue, improved visibility and peak-hour turn restrictions. Roughly 37 percent expressed support for a proposed “road diet” (the above listed improvements as well as reduction of eastbound and westbound vehicle lanes; installation of eastbound and westbound bicycle lanes). Nearly 85 percent of respondents stated that a car is their primary mode of transportation, and more than 50 percent noted that congestion on 6th Street between Fairfax and La Brea Avenues is their primary concern. Any collision, or potential for a collision, is something we want to eliminate. According to crash data obtained from the Los Angeles Police Department (LAPD) and Department of Transportation, there have been nearly 250 reported collisions on 6th Street between Fairfax and La Brea Avenues over the last 10 years, three of which were fatal. The challenge is to ensure any road improvements that are made address the conditions that led to the collisions in the first place. The proposed improvements listed below do precisely that. Based on an evaluation of the collisions that have taken place over the last 10 years, 34 percent, including two of the three fatal collisions that occurred, were caused by unsafe left turns. Unsafe vehicle speeds were determined to be a factor in less than 10 percent of accidents, compared to roughly 25 percent for the city as a whole. 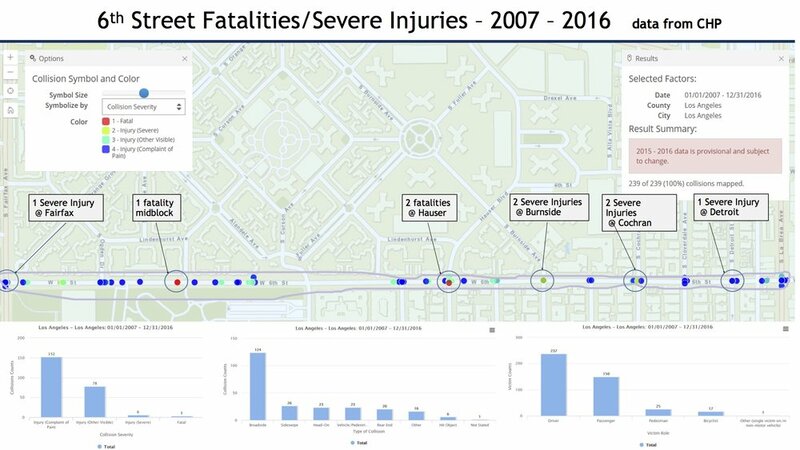 Based on this data, intersection and incident-specific improvements – including the installation of left turn pockets at 6th Street and Hauser Avenue, continental crosswalks, and leading pedestrian interval phasing – will have the greatest impact on pedestrian, cyclist and motorist safety. 6th Street, between Fairfax Ave and La Brea Ave – street resurfacing. 6th St and Fairfax Ave – installation of continental crosswalks on all three segments. 6th St from Fairfax Ave to Curson Ave – extension of single eastbound vehicle lane; installation of approximately 18 new parking spaces. 6th St and Ogden Dr – extension of westbound left turn pocket. 6th St and Curson Ave – installation of continental crosswalks on all four segments. 6th St and Hauser Ave – installation of eastbound and westbound left turn pockets; continental crosswalks on all four segments; removal of peak-hour left turn restriction. 6th St and Burnside Ave – installation of continental crosswalks on all four segments; installation of peak-hour left turn restrictions. 6th St and Cochran Ave – installation of continental crosswalks on all four segments. 6th St and Detroit Ave – installation of continental crosswalks on all four segments. 6th St and La Brea Ave – installation of continental crosswalks on all four segments. Leading Pedestrian Interval Phasing at all crosswalks on 6th Street between Fairfax Ave and La Brea Ave.
6th St and Spaulding Way – new mid-block signalized pedestrian crosswalk. 6th St and Hauser Ave – installation of protected / permissive left turn signals. Over the next few weeks, my office will be working with LADOT, LAPD and the Bureau of Street Services (BSS) to finalize the list of recommended roadway improvements and begin installation. I would like to thank you for your input and patience throughout this process. It is incredibly important that transparency, accountability and the needs and views of all Council District Four residents be included in the decision-making process. Please don’t hesitate to reach out to my office with any further questions or concerns. Both the LADOT and the FHWA say road diets don't belong on roads hosting 20,000 vehicles per day. Some studies such as this one from the Michigan DOT and cited by the Mid-City Neighborhood Council as a justification for a 6th Street Road Diet lower that recommendation to a maximum of 10,000 cars per day. According to the LADOT’s last car count in February of 2014 over 25,000 drivers per day rely on 6th Street. If you're one of them, or if you live or drive on nearby roads, you need to let Councilman Ryu know you don't want this road diet. Councilman Ryu has wisely proposed high-visibility crosswalks and left turn pockets because he has looked at the data and knows that those solutions will actually protect people eon 6th Street. Councilman Ryu wants to hear from you! Let him know that you do not want a “Road Diet” on 6th Street as it will do nothing to prevent the same tragic accidents from occurring again and will only push traffic off the boulevards and onto residential streets. Take his survey of proposed 6th Street Improvements at http://davidryu.lacity.org/6th_street_traffic_safety, call his office and email him. Let him you support his REAL safety improvements and you stand with him against the special interest bike lobby and anti-car activists! Time is running out, so you need to let him know now.